Sign up today for my free character education "kick-start" bundle. I usually send my list some of my resources for free before I put them up for sale on my website. I’ll keep you up-to-date on our offerings and yes, you may get my opinion and tips from experts on certain character building issues as well. Try my activity sheets with story-boarding! Right now, you can also enjoy my first audio adventure and magazine for free. 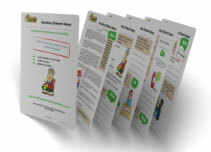 You will be able to download the MP3 file, the kids' magazine and the educational sheets. By the way, you'll need to confirm your subscription to my list with the email provider. That's to protect you and I against spamming and complaints! After you have confirmed your subscription, you'll start receiving my newsletter.